No one could have blamed Fasig-Tipton executives for not including private sales in the results for the recent Kentucky July yearling sale. By excluding the out-of-the-ring transactions, the final numbers would have looked a bit brighter. The average price for 241 horses would have been $81,216 instead of $77,716 (down 12% instead of 15.8%) and the median would have been $60,000 instead of $55,000 (down 20% instead of 27%). Instead the Lexington-based auction house published in its hip-by-hip results the sales of 27 horses that failed to meet their reserves but found new homes back in the barns. Together the private sales totaled $1,255,000 and averaged $46,481. Despite the depressive effect on the sale’s overall statistics, I’m glad Fasig-Tipton chose to include the private sales. These transactions give everyone a bit more information for assessing the commercial strength of a sire’s progeny. RNA (reserve not attained) prices get you in the ballpark but real dollars changing hands is more meaningful. The market was down as expected but it was a solid sale. 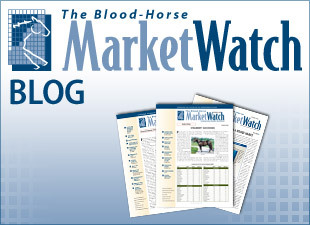 Sometimes average prices are heavily influenced by a couple high-priced stars or several really cheap horses. One way to accommodate for this and assess the real health of a sale is to exclude some of the most expensive and least expensive horses from the results. For the Fasig-Tipton Kentucky July sale I took out the top five highest-priced horses and the five least expensive horses and then recalculated the gross, average, and median (including the private sales). The adjusted average dropped slightly to $73,200 (down 18.3%). The percent change, incidentally, is from the 2008 average minus the top five selling horses and the bottom five. The adjusted gross didn’t fall appreciably more with the top five and bottom five eliminated, dropping 29% as compare with the adjusted gross of 2008 and well within the anticipated decline of 25-30%. The gross for the sale overall was $20,828,000, down 26% from a year ago.